Brandy & Pebbles came into my life back in 1989 as littermates off of Woo's Scooter and Cinnamon Spice's line. Had they not come into my life I wouldn't be here today. They both have saved my life many times over warning me of danger of a stranger in my house, to attacking a rattle snake, warding off a gila monster, and awaking me from a sound sleep from my apartment complex being on fire. Over the course of time I owned Pebbles and Brandywine, I had a serious auto accident caused by a drunk driver. My spinal cord was injured and compressed flat at two and possibly three levels in my neck spine, rendering me an incomplete quadriplegic. My gait was unsteady and arms were weak after the accident. My gait continued to have problems even after surgery due to further compressions in my spine from the accident that surgeons didn't fix or were reluctant to fix. My Dalmatians took over as my service dogs without any formal training. Brandywine started to guide me up in bed after major spinal surgery on my neck and being in a rigid brace and an infected hip bone graft incision site, to assisting me to walk short distances around the house with bracing on them with no equipment at that time, my auto insurance company refused payment for a wheelchair power or manual which I really needed, service dogs, walkers, attendant care, house modifications & medical care I needed to name a few. But, I wasn't going to let the insurance company get the better end of me, while we continue to this day in court battles over my issues of payment for things my insurance company has an obligation to pay for. I continued to struggle every day to walk here or there with the assistance of my two Dalmatians one on one side and the other on the other. Nicked name 'Right' and 'Left' always glued to me to make sure I got where I was walking safely. The times I wasn't assisted by my trusty friends Pebbles and Brandywine I injured my ankle and required a cast during one summer. Over time they would alert others at home if I got sick in another part of the house or help get items for me I couldn't get. I realized once they had passed over the bridge how much I truly missed their assistance in my everyday life. My first one to pass over the bridge was Brandywine. Brandywine would take care of me even when he was blinded by diabetes helping me out of bed daily. Pebbles would whimper which way to go to guide me up. They truly worked as a pair. Eventually, Brandywine had surgery to restore his vision only to have a twisted stomach for 13 hours and two vets later getting to the bottom of his acute pain he was in one evening. He survived that while the whole time caring for my needs. He never would take a day off no matter how sick he must have felt. Pebbles soon picked up after her brother died while she battled chronic renal failure. She lived almost to the exact date a year later from her brother's death date, before passing on to the bridge. Both of these terrific dogs had such an impact on my life and gave me the idea to train a Dalmatian for service work. My very first Dalmatian; a liver and white patched girl. Her name was Lady Oddessey of Pebbles Sundell--Pebbles 1. 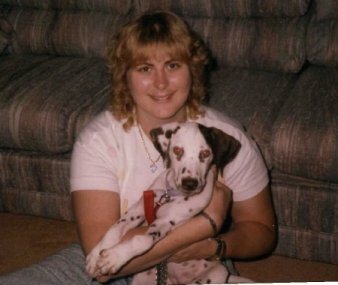 1987-1999 She was the original Dalmatian that turned me onto the breed and especially the liver and white Dalmatians.